Hi Everyone, I hope you are enjoying the new site so far, we have lots planned over the next few months so make sure you come back soon. To launch our new ‘I Made This’ feature I thought I would share one of my personal projects with you! I love up cycling old furniture and turning unloved items into something usable . I stumbled across this cabinet at a local antique fair and thought it was a bargain at £5. All it needed was a bit of TLC so I repainted the cabinet in Annie Sloan Paloma Chalk Paint and then used First Edition Deco Maché distressed polka on the inside of the cabinet to add interest. This paper is one of my favourites in the Deco mache collection as its so versatile and has a lovely vintage feel. One new doorknob later I have a charming cabinet to display all by glass bottles in. What do you think? I'd love to read your comments so leave me a message and tell me how you think I've done. 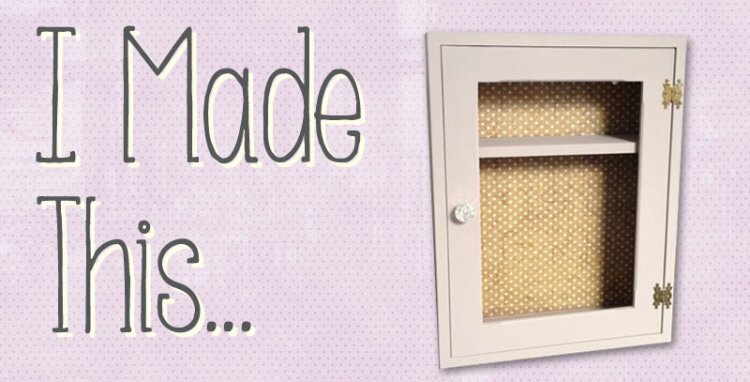 Have you made a project that is special to you, are you crafting with the latest Trimcraft products or are you just really proud of your crafty efforts, tell us all about it and you could feature in our next 'I Made This' feature. Add your project to the gallery, or you can e-mail us.